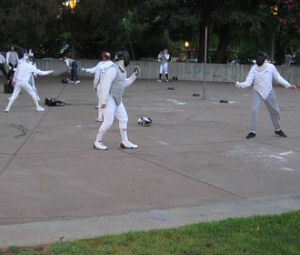 In summertime, when the sun sets late, some Salle DeCesare fencers may unofficially get together at Serra Park in Sunnyvale on Thursday evenings. We enjoy lots of fun conversation and not a little "pick up" fencing! The park's concrete skating area is great for fencing strips, and the stage area has proven ideal for snacks. Fencers and friends usually begin arriving at 7 PM and we achieve a quorum by 7:30 PM. Fencing lasts until the sun goes down or the sprinklers come on (~10 PM). Conversation often continues well after we finish packing up. All fencers are welcome: any skill level, any background, all three weapons. (Children should be with parents or guardians, however.) Bring your electric equipment, if you have it. If you don't, don't worry; we'll fence standard! Sometimes, people want to get a little competitive, but then they remember that, even more than in official classes, it's all in good fun in the park. We take a pot-luck approach. Nothing is required! Everything is appreciated. Some people bring their dinners. Some bring chips, vegetables, cookies, fruit, cupcakes, nuts or many another treat to share. Some bring nothing, and we love them, too. Beer and wine can be popular (don't forget cups!) with those over the appropriate age. These casual park gatherings are informal, unofficial, and undertaken at each individual's own risk. They are not in any way endorsed, overseen or affiliated with the Salle as a group, the FUHSD Adult School classes, Serra Park, the city of Sunnyvale, or any other entity.